How Much Does the 2017 Chrysler Pacifica Hybrid Cost? How Many MPG Does the 2017 Chrysler Pacifica Hybrid Get? What’s New for the 2017 Chrysler Pacifica Hybrid? The available safety features in the Hybrid will make the driver and passengers feel super protected. There are more than 100 standard and available features. The Pacifica is now equipped with the Surround View camera. It included four cameras that are positioned around the minivan to give the driver a 360-degree view. This includes a bird’s eye perspective of the minivan and the surroundings. The advanced features are the Parallel/Perpendicular Park Assist, Adaptive Cruise Control, Forward Collision Warning-plus, and LaneSense Lane Departure Warning-Plus. The standard safety provisions are blind-spot monitoring, rear park assist, rear backup camera, electronic stability control, and electric park brake. The Pacifica comes with a 16-kWh lithium-ion battery. It gives an estimated range of 30 miles only on the zero-emissions electric power. It is expected to be as efficient as 80 mpg. It becomes a part-time electric vehicle when the battery it depleted. It turns into a conventional hybrid where the electric drive system powers the wheels or the 3.6-liter will supplement the wheels. The battery pack is hidden away under the second-row floor in a special battery case. The battery can be recharged in as little as two hours when the 240-volt plug-in system is used. The EVT has two electric motors and both can control the wheels. The Pacifica Hybrid uses a one-way clutch that allows the motor, which is typically only used as a generator, deliver torque to the wheels. The regenerative braking system can convert kinetic energy to electricity. This helps add range by charging the lithium-ion battery. When the minivan decelerates from a higher speed, the high-voltage motor becomes a generator and charges the battery. The Chrysler Pacifica Hybrids is featured with a sculpted, sporty, exterior. It is sophisticated and delivers unmatched style. The sliding door tracks are hidden under the rear-quarter side glass, so you cannot really see them. The front of the minivan has unique front grille pattern and wheel design. The new color for the exterior is Silver Teal Pearl Coat paint. The rest of the color lineup is Billet Silver Metallic, Brilliant Black Crystal Pearl, Bright White, Molten Silver Metallic, Velvet Red Pearl, Jazz Blue Pearl, Dark Cordovan Pearl, Tusk White Pearl, and Granite Crystal Metallic. If you want, you can add a sunroof. It is a tri-panoramic sunroof with dual panoramic sunroof over the first two rows and the glass is fixed over the third row. This ceiling window makes it feel like the minivan is super spacious. The interior upholstery is featured with Black and Alloy with Anodized Ice Cave accents, Ice Blue stitching and black piping. 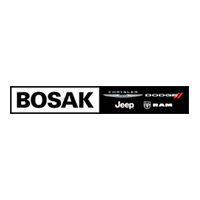 Come check out the 2017 Chrysler Pacifica Hybrid at Bosak Motor Sales in Merrillville, Indiana, and give it a test drive. ** Based on manufacturer’s testing. Actual mileage may vary. EPA estimated miles per gallon of gasoline equivalent (MPGe). Actual mileage may vary. EPA estimate with fully charged battery. Actual mileage may vary.